While we understand that making changes can feel a bit overwhelming, there are simple, healthy, and educated choices we can ALL make daily. There is a vast amount of data, recommendations, options, and information throughout this site. We want to do all we can to ensure everyone has the opportunity to live sustainable lives. Pro Protein Sources are not some gimmicks. When we say Pro Protein Sources we are referring to a varied approach to dietary requirements while taking nutrition and sustainability into account. Listed below are some facts, ideas, and insights into future protein manufacturing, consumption, and available resources. Ensuring an appropriate amount of protein should be an essential part of anyone’s diet. Unlike fat and carbohydrates, the body does not store protein. Protein deficiency can cause hair loss, weak nails, skin rashes, fatigue, and other issues. This is why it is so important to make sure the body gets a sufficient amount of protein everyday from the right sources. According to Cari Neirenberg, writer of the article “How Much Protein Do You Need,” many Americans get plenty of protein each day and Neirenberg believes they may be getting too much from sources such as poultry, meat, and eggs. Also, Neirenberg notes that the majority of people benefit from eating less processed meats. Bacon, hot dogs, and lunch meats are just a few types of processed meat. Furthermore, soy foods, such as edamame, tofu, and veggies burgers can be great substitutes in order to limit the amount of protein taken in by meat sources. Protein should take up no more than one-third of your plate at each meal. Small portions of protein should be eaten throughout the day. In addition, it is important to note that not everybody requires the same amount of protein. Nursing women, pregnant women, athletes, vegetarians, and vegans typically require more protein than the average person; however, many can achieve a higher protein intake without resorting to protein supplements. Xingen Lei, a professor at Cornell University, has been researching the use of algae as a sustainable protein rich feed to replace corn and soybean meal which is currently given to the majority of food producing animals. Professor Lei says, "Current animal feed directly competes against human food sources and, thus, is unsustainable; we must develop alternatives to soybean and corn for animal feeds." Algae produces more oil than corn and also leaves a much smaller carbon footprint than corn. Lei reports that replacing just 10% of all traditional corn and soybean feed with algae feed would make drastic differences in the use of our less sustainable crops. Lei and his researchers are now working to determine what kind of algae to use for feed and also if the differences in the feed will have large consequences in the quality of these animals when human consumption is concerned. This could be a huge break-through for the farming industry and could potentially make a big difference in the sustainability of certain crops which are frequently used as human food. "AllAboutFeed.net - Your Portal on Animal Nutrition, Processing and Feed Management." AllAboutFeed. Web. 06 Mar. 2012. 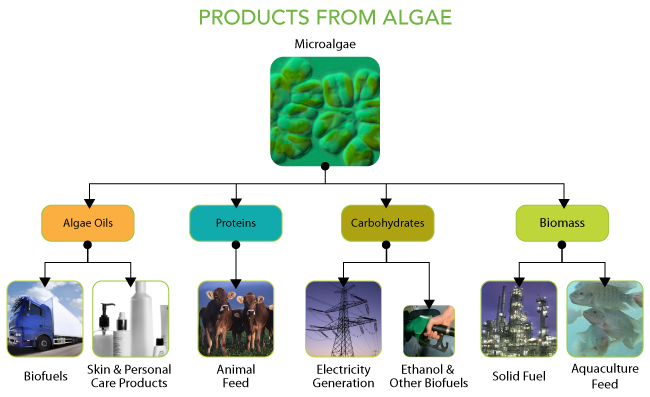 <http://www.allaboutfeed.net/news/algae-as-sustainable-protein-alternative-for-animal-feed-12701.html>. "List Of High Protein Rich Foods." How Much Protein. Web. 06 Mar. 2012. <http://www.howmuchprotein.com/foods/>. Nierenberg, C. "How Much Protein Do You Need?" WebMD. WebMD. Web. 06 Mar. 2012. <http://www.webmd.com/diet/healthy-kitchen-11/how-much-protein>. "Products From Algae." Cellena. Web. <http://cellana.com/products-overview/>. "Today." TODAY.com. Web. 06 Mar. 2012. <http://today.msnbc.msn.com/id/14563169/ns/today-today_health/t/protein-how-much-do-you-need/>.